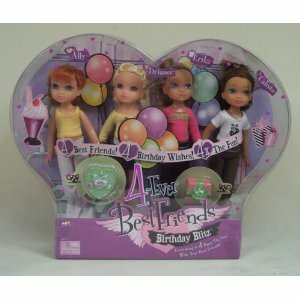 Its 4 times the fun with this 4-Ever best friends doll pack. An attractively packaged set of 4 fashion dolls selected containing 4 of the following dolls; Ally, Brianee, Erika, Calista , Dianthe. Each doll is 25cm tall and comes complete with mix and match outfit. Ball jointed shoulder, the legs go to the front for sitting the doll down.